*Sheep* - Edwards Feeds, Inc.
At Edwards we make many special mixes for our customer who have sheep on their farms. We only have one floor stock item that we make to feed sheep which is called 16% Sheep. We also carry a "Sheep Mineral" made by Purina. Many of you who already know us and visit our store also know our bookkeeper, Carol Leeman (left). 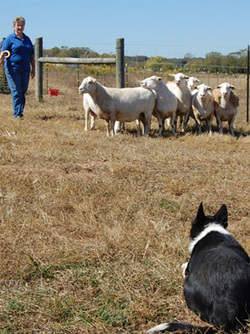 What many of you may not know about is her passion for training border collies and herding sheep. Find out more by clicking on the picture to the left to see an article on one of her trials.